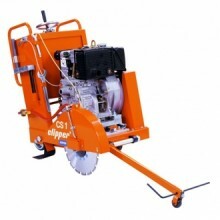 The ideal saw for road repair jobs, patching, reinstatement work, cutting trenches for pipe laying, making expansion joints in concrete floors, cutting out channels for impedance loops or cable laying, and more. The saw has crank handle depth adjustment and adjustable handle bars which provide the operator with an ergonomic and comfortable working position, whatever the cutting depth. Includes a 25 litre, high capacity, removable polyurethane water tank, making it ideal for the wet and dry cutting of concrete and asphalt. Cutting on right hand side only. Frame and handlebar equipped with vibration absorbers. Height and width handlebar adjustment. Depth indication gauge.